Both the Baltic Sea Action Plan and the EU Water Framework Directive requires substantial further reductions of nutrient loads (N and P) to the Baltic Sea during the coming years. Achievements of these goals will only be possible by the implementation of fundamental changes in agricultural practices and land use. This will require the introduction of additional new and innovative measures, because the easiest applicable measures have, in most cases, already been utilised. BONUS Soils2Sea proposes to exploit the fact that the retention (removal by biogeochemical processes or sedimentation) of nutrients in groundwater and surface water systems shows a significant spatial variation, depending on the local hydrogeological and riverine regime to achieve the goals for nutrient load reduction set out in the Baltic Sea Action Plan. The traditional uniform regulations do not account for local data and knowledge and are much less cost-effective than spatially differentiated regulations with measures targeted towards areas where the natural retention is low. In order to fully exploit the potential of differentiated regulations it is required to utilise all local information and find locally designed and optimised solutions. Besides the need for improved knowledge on the subsurface and nutrient transport and retention processes on a local scale, this calls for new innovative governance regimes with active involvement of key stakeholders. Not the least as the new measures most probably will differentially affect stakeholder groups with conflicting interests. If we more accurately can predict where in a catchment N and P are retained by estimating the retention in the different compartments along the flow path, and also include the delayed effects of mitigation measures due to long solute travel times in groundwater, then we can more cost-effectively design measures to reduce the nutrient loads to the Baltic Sea. 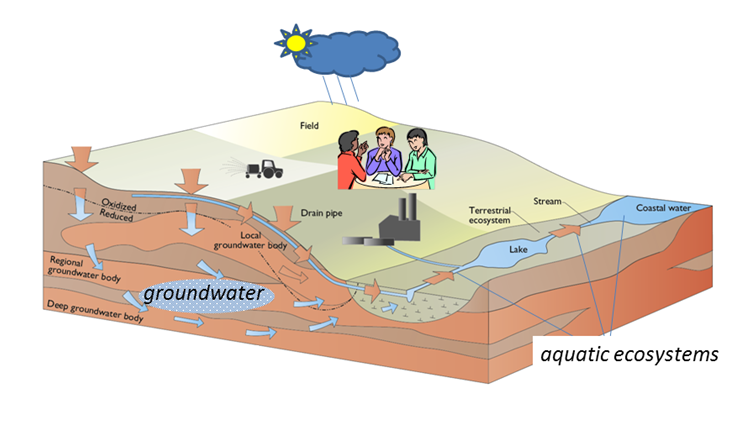 BONUS Soils2Sea will therefore study the retention of N and P between the soils/sewage outlets and the coast, including transport pathways such as overland flow and flows in macropores, subsurface tile drains, shallow and deep groundwater, rivers, wetlands and lakes. The concept and the BONUS Soils2Sea work packages are illustrated in the figure below.